How has Free Software transformed not only software, but also music, film, science, and education? 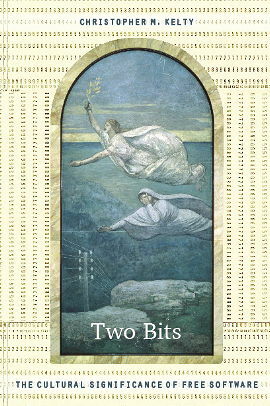 Anthropologist and Savage Minds blogger Christopher M. Kelty explores this question in his new book “Two bits” that now is “available for purchase, for download and for derivation and remixing” as he writes. A really web 2.0 book in other words. It is both available on paper (published by Duke University Press) and online - freely accessible. Both book, blog and wiki! Drawing on ethnographic research that took him from an Internet healthcare start-up company in Boston to media labs in Berlin to young entrepreneurs in Bangalore, Kelty describes the technologies and the moral vision that binds together hackers, geeks, lawyers, and other Free Software advocates. Kelty shows how these specific practices have reoriented the relations of power around the creation, dissemination, and authorization of all kinds of knowledge after the arrival of the Internet.